We were less enthused about consistently being labelled a CIA ‘front’ by the French journal, Le Monde Diplomatique, who consistently declined offers to have free reign of our accounts. Others suggest additional links to MI5 and regularly referred to the fact that TI’s earliest corporate supporter, GE, had been heavily fined for its part in international corruption in 1992. …corporate interests unhappy with our creation were getting their retaliation in first. If some people were not unhappy with us, then clearly we were wasting our time. GE ‘… [pleaded] guilty to diverting some $26.5 million from the U.S. foreign military aid program used to finance General Electric’s sale of F-16 jet engines and support equipment to Israel. […] The company said in a statement that it took responsibility for the actions of a former marketing employee who, along with an Israeli Air Force General, diverted Pentagon funds to their own bank accounts and to fund Israeli military programs not authorized by the United States. Let’s just think about this. A huge US multinational war monger — a merchant of death permanently fanning the flames of discord, is so brazen that it gets caught doing what? It is in charge of millions of US tax dollars (yes selling war needs a form of socialism) which went astray — given the level of overt support, what one wonders is an Israeli military programs not authorized by the US. The answer is probably murder, but since when did the US confront Israel on that? So one of the organisations that helped set up Pope’s company provides the weapons that Israel uses to bomb the territories it thinks belong to it and are run by terrorists who should be wiped off the face of the Earth. But Pope didn’t really look at it like that, like a good ‘marketing employee’ he just wanted the money. After assuring us of the lack of any contact with the intelligence world he mentions another founder of TI, George Moody-Stuart of the huge multi-national Shell. Type that into Google and the first hit you’ll get is an article by Alfred Donovan, written for the nephew of Ken Saro-Wiwa, Charles Wiwa, one of the parties in a US Class Action lawsuit being brought against Shell in respect of what it did in Nigeria. I won’t go into the details, but with Shell and General Electric backing them, the idea of the CIA providing direction for TI or using it in some way seems by the by. But why shouldn’t the US government (that’s who the CIA are supposed to work for) fund TI by some round about way: it is not that it is opposed to the the universal expansion of capitalism, it is all for it, it is an agent for it. Let us turn back to this CIA allegation. One fact we can examine is that John Brademas, is Chairman of the National Endowment for Democracy, and a member of Transparency International’s International Advisory Council. The NED was concocted to put a mask over what the CIA used to do. It was heavily involved in Reagan’s ‘Project Democracy.’ Aspects of this stretched from Oliver North’s insane adventures to ‘Democracy Promotion’ during and after the cold war. That meant funding anti-soviet rebels in Afghanistan (including before the Soviets invaded to goad them into doing so), and dissidents in Poland and Eastern Europe (this also went alongside George Soros’ endeavors). Money was also sent to anti-CND groups in the UK and Europe. 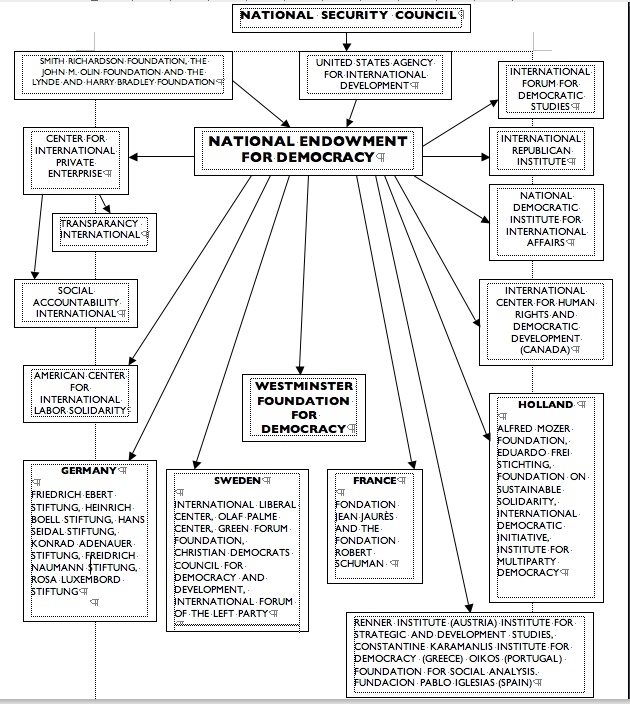 When the cold war ended the NED funded various organisations to meddle with the elections with an organisation called the IFES who also fund Transparency International. This is the International Foundation for Election Systems (IFES) which was established by F. Clifton White who worked with CIA director William Casey on the Reagan administration’s pro-contra propaganda network (see: IFES (2007) International Foundation for Election Systems web site, About IFES, http://www.ifes.org/board.html and the Clifton White profile at http://www.zoominfo.com/directory/White_F._27279966.htm). The purpose here, if we can reduce it to one thing, was to open up the former Soviet Union to US capital and the expansion of NATO. The network is very complicated and below I’ve sketched out how interlinked it is below. We can break this down further and explore the network within the NED. The likelihood is that TI is more or less a front for its corporate funders — making them look like they are doing something about bribery and corruption rather then participating in it. The bulk of the money comes from the Foreign Offices of various EU states and this would mean they find that TI acts in their interests in pushing other countries (probably ex-colonies) around. So it all depends on what selective focus we can identify in what TI actually does, who it finds wanting and why. We must also examine the timing of their campaigns and their outcomes in terms of who benefits. …currently serves as a member of the board for American International Group, ChevronTexaco Corporation, Lucent Technologies Inc., and Time Warner. He serves on the Advisory Council to the Center for International Media Assistance of the National Endowment for Democracy. Dr. Hyman served with the U.S. Agency for International Development (USAID) from 1990 to 2006, and was director of the Office of Democracy and Governance from 2002 to 2007. The CSIS was founded in 1964 by Admiral Arleigh Burke who oversaw the Naval aspects Bay of Pigs invasion of Cuba and fell out with Kennedy over it. He then set up the US’ secret team of assassins, the Navy Seals. It was also started by David M. Abshire,responsible for the public diplomacy mission to make sure cruise missiles were stationed in Europe in the 1980s (until he was brought back to dig Reagan out of the mess of Iran/Contra). 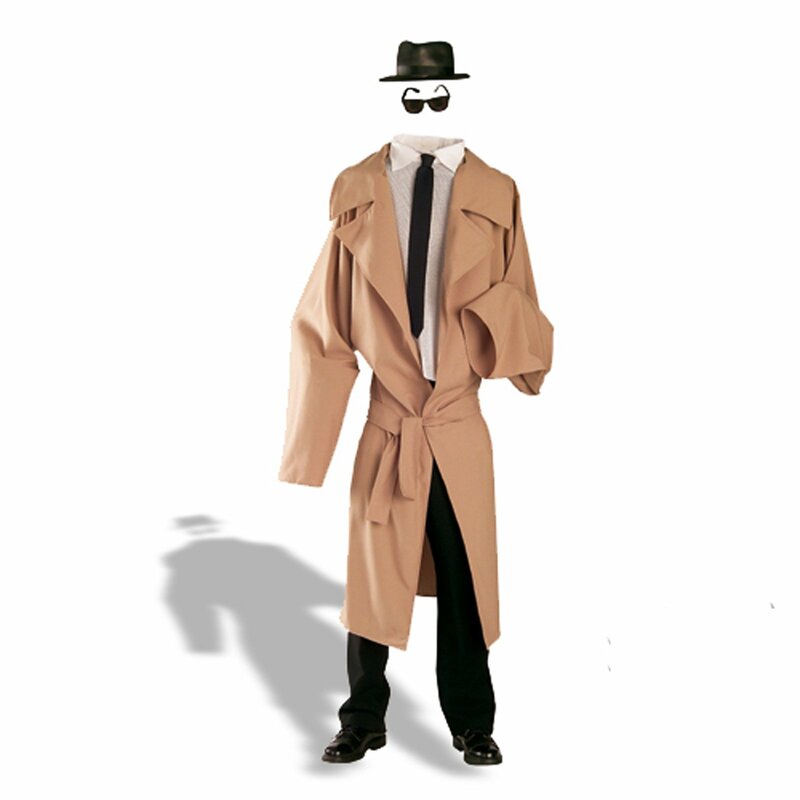 Are Transparency International far away from the CIA or the NED? No: they interlock. Through our close cooperation with the Defense Department we are actively implementing the “3Ds” of U.S. National Security Strategy –Diplomacy, Development, and Defense […] USAID has been forging ahead strengthening its institutions to meet the challenges of today and tomorrow. USAID has launched the Development Leadership Initiative (DLI) to significantly increase the size of its permanent Foreign Service Officer corps enhancing the impact of its programs with more “development boots on the ground.” Our increased size and presence enables us to further strengthen country ownership and implement smaller, more tailored programs that will have a great impact. We are at the frontlines of America’s smart power. Vietnam to fly during the war. During this tour, he flew 550 combat sorties in support of the Navy Seals and riverine forces. He now works with USAID. Other participants include Robert Mosbacher, Jr., who inherited the huge Mosbacher Energy Company of Houston, Texas, an independent oil and gas exploration and production company. For Boswell TI is independent from government, but I can’t see evidence of this and plenty of evidence to the contrary is easy to find. So who are TI. Transparency International (TIUK) is based on the 3rd Floor of the Downstream Building, 1 London Bridge, London SE1 9BG. It is part of a collective called Mezzanine 2 comprising some 50 organisations including Internews. 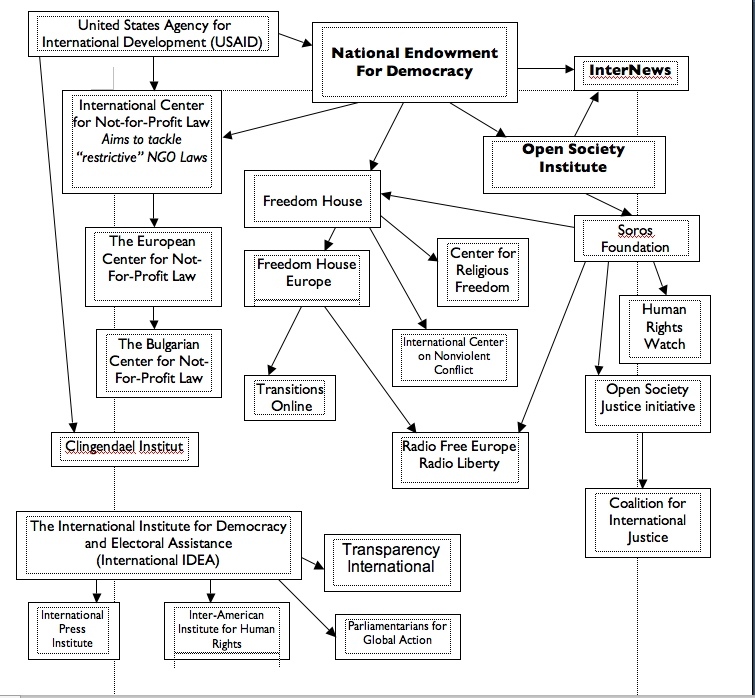 This is a development from the Mezzanine office used by groups such as Demos, CAN, ERA, Foreign Policy Centre, Ashoka and The Policy Network as a nexus of lobby front groups, think tanks, astroturf organisations, funding bodies, venture philanthropists and political action committees. It also had the NED’s Internews above. TIUK had a connection with this previous group through Peter Eigen of Transparency International now also with The Extractive Industries Transparency Initiative. Peter Berry is a CMG, or ‘Call Me God’ as they are fondly called. President and Chairman of the International Management Committee of the Establishment money-spinner the ‘Charities Aid Foundation’ (1), along with Lord Cairns the ‘Receiver-General’ (that’s bag man to you and me) of the Duchy of Cornwall—Cairns collects all that ancient Feudal scrounge. Berry, on the other hand is the croupier of a relic of the British Empire, the Crown Agents for Overseas Governments and Administrations (and its banking and asset management subsidiaries), which he joined in 1982, and is now the President of their Foundation which celebrates its 175th anniversary. Crown Agents fund Transparency International’s and Berry was a founder member of TIUK’s advisory council, another indication of the paucity of TIUK’s much vaunted ‘independence,’ which should be a central feature of any analysis of the organisation together with the methods and the targets of its fight against corruption. Formerly Berry was the manager of Kuala Belait Brunei (1968) Indonesia (1970); Anglo Indonesian Corp., (1973); Thomas Tapling Ltd 1987; Anglo-Eastern Plantations Plc, 1991; Rubber Growers Association, (1978-82). Because of the magnitude of advances, together with the continuing difficult nature of some of the situations to which the Board is committed, it is inevitable that the final amounts which will be recovered cannot yet be precisely calculated. The Comptroller and Auditor General, Sir John Bourn, is an Officer of the House of Commons. And the subsequent revelation that the Members of the Board during 2004 were D. H. Probert CBE and Chairman P. F. Berry CMG. Mr Probert must be a wild character whose out bursts of protest necessitates a personal chairman. They certainly have carte blanche and need account to no one when it comes to doing whatever they want with the fabulous assets of the organisation, page 4 tells us that if they blow the lot they will be bailed out and if they make a bit of money some of it might be creamed off: all they have to do is provide four pages of ‘accounts’, the term clearly contradicted to meaninglessness a priori. Who gives a toss they have been rubber stamped by that stickler for detail John Bourn by page 8. The Gross income for both 2004 was ZERO which cost (in Administration and other expenses Thirteen Grand in 2004 and then walloped up to Thirty-four the following year. Its Current assets are the same figure for ‘Cash at bank and in hand’ £1,734 with a Fiver popping up the following year. The cost per year to manage the money sitting in the cashbox or in the bank breaks down like this: Management charges for the year (£14,000) , Auditors remuneration (£4,000) Legal and professional expenses (£6,000 and then £5,000 — the vacuum of the accounts are dizzying but this could mean something staggering: that even the lawyers feel guilty about taking the money) Payment of property taxes have possibly been put off till next what with all the chaos. It gives big loans to its subsiduaries, namely Four Millbank holdings which got £219,630 way back in 1971 and to the novice there seems a hell of a lot written off and a hell of a lot of adjustments adjacent to large amounts of money —nine figure sums. The chairman’s reports say not much more than “The majority of the Board’s assets relate to companies in the property and secondary banking sector which are in the hands of liquidators or receivers.” Buy we can rest assured that any proceedings from the wind-up will wing their way back to the Treasury. Berry is also chairman of the Martin Currie Portfolio Investment Trust plc (which manages £12.6 billion for a range of institutions); non executive director of Henderson TR Pacific Investment Trust plc (with other inspectors Arms and Oil people and ‘Old Money’ going back to the Opium wars); He is an adviser to the government’s trade development arm, Trade Partners UK, and a retained adviser on economic development to the Corporation of London. Berry is also a director of Kier Group plc: Its activities span building and civil engineering contracting, open-cast mining, facilities management, residential and commercial property development and of course the succour of PFI project investment. Major shareholders include: JP Morgan Chase & Co, Barclays Bank Plc, Legal & General and Lloyds TSB Group PLC. Also a director of Bank and a Governor of the Scottish Crop Research Institute (who have a powerful lust for genetic modification). Baroness Chalker of Wallaseywho is the subject of a separate post; Philippa Foster-Back: According to a biographical note on the Institute of Business Ethics Website: She began her career at Citibank NA before joining Bowater in their Corporate Treasury Department in 1979, leaving in 1988 as Group Treasurer. She was Group Finance Director at DG Gardner Group, a training organisation, prior to joining Thorn EMI in 1993 as Group Treasurer until 2000. In 2001 she was appointed Director of the Institute of Business Ethics. She has a number of external appointments, including at the Ministry of Defence, where she sits on the Defence Management Board and chairs the Defence Audit Committee; she sits on the Board of the Institute of Directors and the Professional Accreditation Committee; and the Association of Corporate Treasurers, where she was President from 1999 to 2000. In 2002 she was appointed a Commissioner of the Public Works Loan Board. Contracts galore there. All those smart lawyers, Lords and constitutional experts: and no one thought that loans would blow through the hole. It is not really a huge qualification for a place on an organisation supposedly fighting corruption such as Transparency International, but then who have TI ever caught out? The only real problem they identify is all this freedom of information: the Committee asserts that ‘openness can be used to increase the worryingly low level public trust of politicians in the UK.’ Yes, if people find out what is really going on in simple terms of what the hell happens to their actual money —they might not like it. If you go ‘around the world’ you come back to where you started so, let’s not fool ourselves: “Out there” might as well include “in here”, and this is the problem with TI it is all about finding corruption elsewhere—but what fool just hands himself in. The BAe case was abandoned because, according to the Financial Times to continue with it would damage “UK/Saudi security, intelligence and diplomatic co-operation.” So any corruption hunters should look “out there”, elsewhere, not here, and that they (being of it) must surely not, in the wake of being warded off by persons known, identify the process whereby the security, intelligence and diplomatic nexus controls things with impunity. Clearly then, as with the Al Yamamah case, the task is to put bungs into deserving pockets, i.e. those who maintain security, intelligence and diplomatic co-operation. Now Goodhart is a council member of the The Royal Institute of International Affairs and was a speaker at Chatham House and the Defence Academy’s – “Winning the Peace” along with Rt Hon Lord Ashdown KBE the President of Chatham House; Lyse Doucet, Presenter, BBC World; Sir Ronnie Flanagan GBE QPM now with Her Majesty’s Inspector of Constabulary; Professor Christopher Greenwood CMG QC, Barrister and Professor of International Law, London School of Economics and Political Science; Lt Gen Sir John Kiszely KCB MC, Director, Defence Academy of the United Kingdom; Dr Robin Niblett, Director, Chatham House; Rear Admiral Chris Parry CBE, Director General, Development, Concepts and Doctrine, Ministry of Defence; Douglas Brand, Chief Executive Officer, Global Conflict Solutions; Dr Roger Hood QVRM TD, Defence Adviser & Corporate Strategist, FUJITSU Defence & Security; Professor Sir Michael Howard; Steen L Jorgensen Director of Social Development, Sustainable Development, The World Bank; Bill Mawer, Vice President Strategy and Technology, Smiths Detection; Louise Perrotta, Conflict Resolution and Rule of Law Adviser, Foreign and Commonwealth Office. Transparency International also hasSir Nicholas Monck: Former Permanent Secretary to the Employment Department and Second Permanent Secretary to the Treasury. According to Who’s Who, Monck is an ‘international consultant’. Monck’s Treasury work has also involved Privatisation, especially BT & Water and Competition policy: takeovers & restrictive practices. Monck is also a Senior Associate at the Oxford Policy Management and Chair of the Oxford Policy Institute; Member of Fabian Commission on Taxation, 1998–2000; Council member of the National Institute of Economic and Social Research; 1995–2000; Deputy Chairman of the Investment Management Regulatory Organisation (IMRO), 1995–2000 and director of Standard Life 1997-2005. 2001 Albania: Workshop on Public Administration Reform. 2001 Ethiopia: Public Enterprise Reform & Privatisation. 1999 UK: Good Practice in Public Expenditure Management. 1999 Tanzania: Joint author of a report on strengthening capacity of Government Economic Service. 1999 Hungary: Member of a team producing ‘Guide to Output and Performance Measurement in Central Government’. 1998 Cuba: Presented paper on UK experience to International Seminar on Role of the Treasury in Reform Process of the State’s Financial Administration. 1996 Bulgaria: Report on Planning and Managing Public Expenditure in Bulgaria with emphasis on leading a value for money drive from the Ministry of Finance. 1996 Mexico: High level seminars about innovations in the UK public sector in the last decades leading to improvements in the control and value for money of public expenditure and to improved quality of service and accountability. 1996 Hungary: Produced a report on future policy and management of their Social Security (ie. Health and Pensions) Funds. 1996 South Africa: Member of team producing an Institutional Review of the Land Reform Programme. Baroness Whitaker: council member of Friends Provident’s Stewardship Trust She is a member designate of the proposed Joint Parliamentary Human Rights committee, a member of the European Union Select Committee on social Affairs and International Development Liason Peer. She is vice-president of the British Humanist Association, vice-Chair of the Parliamentary Labour Party Civil Rights and International Development Committees and vice-chair of the All Party Group on Ethiopia. She is a member of Transparency International (UK)’s Advisory Council and of the Council of the Overseas Development Institute. Baroness Whitaker is also council member of SOS Sahel, vice-president of One World Trust, a patron of the Runnymede Trust and a member of Population Concern. She is currently the Labour Party International Development Liaison Peer, Advisory Board of the British Institute of Human Rights. She is a trustee of UNICEF UK, a member of the UNA-UK Advisory Panel. Laurence Cockcroft, Chairman: Cockcroft is a development economist who has worked for the Governments of Zambia and Tanzania, as a consultant to various international organisations (UN, FAO, World Bank, etc. ), for a large private UK-based agri business company (Booker) and for the Gatsby Charitable Foundation. He was a founder member of the boards of Transparency International and Transparency International UK, serving two terms on the former. During the period from 2000-2002 he has chaired the international group which has developed the Business Principles for Countering Bribery. He became Chairman of TI-UK in 2000 and pioneered the work of TI-UK on Corruption in the Official Arms Trade. ‘… that TI in the UK ‘needs to focus more on what is going on in defence and politics’. In the private sector changes happen much faster than in the political or public sectors. The day after Cockcroft’s forum, the Financial Times reported that there had been no major prosecutions of businesses for corrupt practices. The paper quoted Cockcroft as saying that corporate behaviour would ‘only change markedly when there are a couple of high-profile prosecutions’. At the most senior level, Cockroft said, ministers have access to information and decision-making powers that have the potential to earn them millions of dollars, so doubling or tripling their salaries can have little effect. “If we move up the scale to the level of ministers, then certainly in terms of the developing world, whether we’re looking at India or Cameroon or Colombia, the fact of the matter is that ministers are paid a small sum and do find it difficult to survive on those salaries,” he said. Access to information and decision-making powers would seem to be a hard thing to extinguish in world affairs. Michael Hershman was a Special Agent with U.S. Military Intelligence and both the Ford Foundation and USAID have close connections with the US Secret State. Hersham was a co-founder of Transparency International and the chair of Decision Strategies/Fairfax International— now one of the biggest private investigation, security and business intelligence companies in the US. Or so they say. “Michael Hershman began his career in intelligence and investigations in Europe during the late 1960’s as a Special Agent with U.S. Military Intelligence, specializing in counter-terrorism”. After leaving the military, he has worked for the New York State Attorney General’s Office and the Office of the Mayor of New York City. Later, he served as a Senior Staff Investigator for the Senate Watergate Committee and as Chief Investigator for a joint Presidential and Congressional commission reviewing state and federal laws on wiretapping and electronic surveillance. He also worked for Federal Election Commission, as Chief Investigator and Director of Security, and as Deputy Auditor General for the Foreign Assistance Program of the U.S. Agency for International Development (AID), Hershman serves on the Board of Directors of the [[U.S. Chamber Foundation]] and is a Member of the U.S. Chamber Homeland Security Policy Group and the Coalition against Counterfeiting and Piracy. He is also Chairman of the Board of Advisors of INFRAGARD an FBI program which links with the private sector for information exchange on homeland security issues”. “USAID’s attempt to make the process both secret and ultra- quick has drawn suspicion, criticism and investigations. Sen. Susan Collins, R-Maine, the chair of the Senate Committee on Government Affairs, is co-sponsoring the Sunshine in Iraq Reconstruction Contracting Act of 2003, which would make public all documents on secret Iraq contracts that aren’t classified. Indeed, Halliburton suspicion? Iraq Revenue Watch would seem to think so. But is was Hershman’s connection with USAID (part of the NED ‘Family’) that brought money to the table of Transparency International. Jeremy Pope has started up his own organisations Tiri with similarly high level funders. According to TI The first Board comprised Chairman Peter Eigen (Germany), Vice-Chairman Kamal Hossain (Bangladesh), Vice-Chairman Frank Vogl (USA), Laurence Cockroft (UK), Dolores Espanol (Philippines), Theo Frank (Namibia), Joe Githongo (Kenya), Michael Hershman (USA), and Gerry Parfitt (UK). The first Advisory council comprised Oscar Arias Sanchez (Costa Rica), Paul Batchelor (UK), Peter Berry (UK), Alberto Dahik (Ecuador), Boubakar Diaby-Ouattara (Ivory Coast), Ugo Draetta (Italy), Hansjörg Elshorst (Germany), Dieter Frisch (Germany), Johan Galtung (Norway), Roy Herberger (USA), Gerhard Kienbaum (Germany), Alain Marsaud (France), Ian Martin (UK), Hans Matthöfer (Germany), Ronald MacLean Abaroa (Bolivia), Peter MacPherson (USA), Ira Millstein (USA), Festus Mogae (Botswana), Miklos Nemeth (Hungary), Olusegun Obasanjo (Nigeria), Ahmedou Ould-Abdallah (Mauritania), Devendra Raj Panday (Nepal), Joe B. Wanjui (Kenya), Andrew Young (USA). According to TI funding from the Ford Foundation was organised by Fritz Heimann Counselor to the General Counsel, General Electric Company and founding member and director of Transparency International. Heimann writes for the Council on Foreign Relations’ Foreign Affairs with John Brademas, Chairman of the National Endowment for Democracy, and a member of Transparency International’s International Advisory Council. Fritz Heimann was Chair of Transparency International-USA from 1993 to 2005. For someone crusading against corruption Heimann adopts some strange tactics. In October 2002, parliamentarians from different parts of the world set up the Global Organization of Parliamentarians against Corruption (GOPAC). In 2003, a committee made of representatives of the private sector (including General Electrics, PricewaterhouseCoopers (Gerry Parfitt mentioned above is PwC) and Shell International), non-governmental organizations, the European Bank for Reconstruction and Development and the Trade Union Advisory Committee to the OECD elaborated the Business Principles for countering bribery. See Julie Bajolle (2005) The origins and motivations of the current emphasis on corruption: The case of transparency international. Represents states, government agencies and international organisations in relation to proceedings in England and elsewhere; representing Kuwait’s Oil Sector companies in claims to the United Nations Compensation Commission. Areas of expertise include state and diplomatic immunity, status, privileges and immunities of international organisations, upstream oil and gas operations, international economic sanctions, maritime and territorial boundary issues, world trade law, jurisdiction, conflicts of laws, extraterritoriality. To find out inside information on the deal he could have went to Transparency International’s ‘president’, Baroness Chalker of Wallasey and talked about her work with Merchant Bridge and Co. Ltd . They are the advisor to the British Government on the Offset Programme which is a supposed £1 billion economic investment agreement in Saudi Arabia as part of the Al Yamamah (‘the Dove’) arms deal. MerchantBridge thus become part of the UK Ministry of Defence’s Saudi Armed Forces Project — the staff includes a number of secondees from BAe Systems. Merchant Bridge runs the ‘Iraq Construction Materials Fund’ to finance manufacturers and suppliers of construction materials in Iraq. Materials such as ready mixed concrete: Chalker is a member of the international advisory board of Lafarge et Cie — which, following the acquisition of Blue Circle, became the world’s leading cement producer. One of the anomalies of Transparency International’s map of corruption is that it appears to ignore that Western companies are said to fuel corruption abroad, or factor in the relevant amounts. In Transparency International’s Bribe Payers’ Index, which measures perceptions of the frequency with which bribes are paid by companies from the 19 leading exporting countries, the US appears in the middle of the ranking. But of the world’s leading exporters, the ‘US government is perceived to be the most likely to engage in ‘unfair practices’ to benefit its businesses’. Carver is also a trustee of the Thunderbirds-sounding International Rescue Committee-UK. The IRC “serves refugees and communities victimized by oppression or violent conflict worldwide. Founded in 1933, the IRC is committed to freedom, human dignity, and self-reliance. This commitment is expressed in emergency relief, protection of human rights, post-conflict development, resettlement assistance, and advocacy.” Its overseers include such peacemakers as: Madeleine K. Albright, Henry A. Kissinger, Colin Powell, James D. Wolfensohn; and John Drysdale, Neil Holt, Lady Moody-Stuart, Anne Moore-Willliams, Monty Raphael, Ian Trumper, Kate Wilson, Karl Ziegler. Former Directors: David Murray: Senior Adviser to the Chairman, The Extractive Industries Transparency Initiative International Advisory Group, and former Deputy Chairman, TI(UK). Earlier the Executive had met to discuss the role of Lobbyists in the parliament. Mitchell and Sikka’s enquiry notes that in addition to ‘auditing’ the late Robert Maxwell since the 70s: “Price Waterhouse simultaneously acted as auditor, the eyes and ears of the regulators and advisers to BCCI management […] The audit firm acted as private consultants and advisors to BCCI management to further their ‘private’ interests. Yet at the same time the state was expecting them to perform ‘public interest’ functions by acting as an external monitor and quasi-regulator” (p.37). Transparency International”’, (TI) was co-founded by Peter Eigen and Michael Hershman. Another founding member of Transparency International, and Secretary-General for Jamaica, Ms Beth Aub, resigned her membership of the ‘global anti-corruption body’ in 2004, alleging corrupt practices such as “facilitation payments” by TI, a term she described as another name for bribery and corruption. BETWEEN € 50,000 AND € 200,000: Federal Foreign Office, Germany, Royal Danish Ministry of Foreign Affairs (DANIDA), Chr. Michelsen Institute, Norway, Australian Agency for International Development (AusAID), Ireland AID, The Charles S. Mott Foundation, USA. OVER € 200,000: European Commission, Ministry for Foreign Affairs, Finland, Federal Ministry for Economic Cooperation and Development (BMZ), Germany, Swiss Agency for Development and Cooperation (SDC), US Agency for International Development (USAID), Department for International Development (DFID), UK, Ministry of Foreign Affairs, The Netherlands , Canadian International Development Agency (CIDA), Norwegian Agency for Development Cooperation (NORAD), The Ford Foundation, USA, AVINA Group, Switzerland, Swedish International Development Cooperation Agency (SIDA), Royal Danish Ministry of Foreign Affairs. *Exxon, General Electric, Lafarge, Merck, Norsk Hydro, SAP AG, Shell International, Sovereign Asset Management, Sovereign Global Development, Anglo American, Nexen, UBS. Companies participating in this initiative typically contribute 50,000 Euro per year to Transparency International. ABB, Amanco, Bombardier, BP, Calvert, Consolidated Contractors, F&C Asset Management, Fluor Corporation, Halcrow, Hilti, Hochtief, International Federation of Inspection Agencies, ISIS, Merck, Motorola, Norsk Hydro, Pfizer, PricewaterhouseCoopers, Rio Tinto, SGS, Sika, Skanska, SNC Lavalin, TRACE. William F. Biggs (USA), Hartmut Fischer (Germany), Arnesto Goncalves Segredo (The Netherlands), Basel Institute on Governance (Switzerland), Center for International Private Enterprise (CIPE, USA), Deutsche Investitions- und Entwicklungsgesellschaft (DEG, Germany), European Bank for Reconstruction and Development (EBRD), Fondation Pro Victimis (Switzerland), Gesamtverband Kommunikationsagenturen (GWA, Germany), KPMG, IHK Frankfurt (Germany), Lahmeyer International, Ministry for Foreign Affairs Norway, Ministry of Foreign Affairs and Trade New Zealand (NZAID), Partners of the Americas (USA), Stockholm International Water Institute (Sweden), The World Bank (IBRD). The origins and motivations of the current emphasis on corruption by Julie Bajolle, Joint Research Centre on Transnational Crime, Italy. This article offers a critical analysis of the development of the anticorruption movement and of the anticorruption NGO Transparency International. It looks at the self-interest underlying some anti-corruption initiatives, and at the composition and management of Transparency International. According to their own reports, for instance on Afghanistan, schemes for rent extraction are a major form of corruption. There seems no way around concluding neoliberalism is corruption institutionalized; as the main policy here seems to be the selling of of social infrastructure to rent seeking entities, and weaken democracies to do just that. Thanks for the elaborate reporting; I could have been clicking and scrolling for hours, were it not for stumbling upon your inclusive oversight! Very true rijkswaanvijand, very true — but their reports are relied on and quoted by people who should know better about these games. nice article………several inaccuracies, and of course it would need updating now that the US TI has withdrawn from the organization and the UK Bribery Act has been passed (but without teeth). but generally there is a lack of self criticism in this anti-corruption ‘movement’. Some perspective is necessary, however. TI’s budget has been 10-12 mill eur per year. This is really the cost of like , one airplane. There is a question of scale here. anyway…nice job connecting the dots.